From the 1870s until the 1950s, Philadelphia’s politics were dominated by its Republican Political Machine, a powerful cadre of Republican businessmen and politicians who earned the city the unflattering description of “corrupt and contented.” These men were often elected through fraudulent elections and voter intimidation and appointed their supporters to lucrative positions of power. 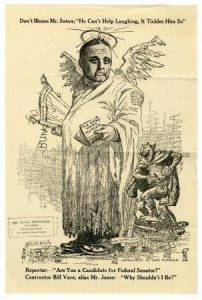 One of these men was William Vare, a member of the U.S. House of Representatives, shown in this scathing early twentieth-century political cartoon. Vare was engaged in a political rivalry with fellow Republican Jim McNichol that spilled out into the streets of the Fifth Ward and led to the murder of a police officer. On the day of the 1917 primary election for Select Councilman, the Vare-aligned candidate Isaac Deutsch ran against McNichol’s candidate, James A. Carey. That night, Carey was beaten by a gang from New York City, the Frog Hollow Musketeers, who were believed to have been hired by Deutsch’s supporters. In the struggle, Philadelphia police officer George Eppley was killed. In this cartoon, Vare is depicted wearing a tattered angel costume while the devil laughs at his feet. He holds in his hand a book titled “The Fifth Ward Murder.” Vare served in the U.S. House of Representatives from 1912 to 1927. Philadelphia Mayor Thomas B. Smith was indicted for conspiracy for his alleged complicity in the Fifth Ward murder of police officer George Eppley. 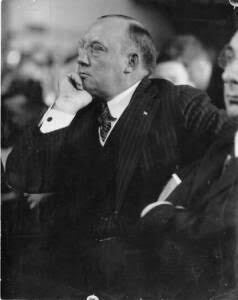 Eppley was gunned down on the night of the 1917 primary elections for Select Councilman while defending James A. Carey, one of the candidates, from a gang of New York City gunmen hired by supporters of his opponent, Isaac Deutsch. Smith was alleged to have sent police officers to protect Deutsch. Smith was acquitted, but the incident permanently tarnished his reputation. He did not run for reelection and fellow Republican J. Hampton Moore became the new mayor of Philadelphia. The Fifth Ward and environs was rife with racial and political violence and riots in the nineteenth century. 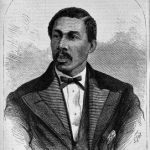 African American rights activist Octavius Catto was one victim. Catto rose to prominence in the mid-nineteenth century as a proponent of desegregation of the city’s public transportation. In 1865, Catto boarded a trolley in Philadelphia and refused to leave his seat, where he remained for the entire night. A year later, with his help, the trolley system was desegregated. Catto was also instrumental in breaking the color barrier in the city’s baseball team when his Philadelphia Pythians played against the Olympics, the city’s oldest baseball team. It was the first time an all-black and an all-white team competed against one another. This activism made Catto a target for racially-motivated violence. On Election Day in 1871, one year after the Fifth Amendment restored African American men’s voting rights, Catto was gunned down by two white men, Frank Kelly and Edward Reddy Denver. Catto had passed the men while returning to his South Street home to retrieve ammunition for his revolver. Catto attempted to flee after the first shot was fired, but was shot again at close range. He died on the scene. Over five thousand people attended his funeral, some coming to Philadelphia from as far away as Mississippi to pay their respects. In the mid-twentieth century, the Fifth Ward was subject to a major urban renewal campaign spearheaded by Mayor Richardson Dilworth. The neighborhood was rebranded Society Hill, an old moniker derived from the Free Society of Traders, a colonial-era Quaker merchant union once based in the neighborhood. Many of the worst areas of the neighborhood were cleared, but an effort was made to save historic homes, which were sold to buyers who agreed to follow preservation guidelines. The Society Hill Towers, three residential high rises (middle top) designed by I. M. Pei in the Brutalist style, were completed in 1964. 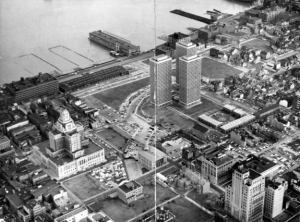 These changes brought new residents into the city, but displaced the poor working-class residents and small businesses that once called its tumultuous streets home. Philadelphia’s Fifth Ward, south of Chestnut Street near the Delaware River, became infamous in the late nineteenth century for election-day riots among the Irish, blacks, and the police, with ward boss William “Bull” McMullen (1824-1901) at the center of the violence. By the early twentieth century, the area had become known as the “Bloody Fifth,” a district of rampant political violence where politicians exploited residents, mostly immigrants, for their collective vote a short distance from Independence Hall. The Fifth Ward originated as part of the reorganization of election wards following the consolidation of Philadelphia city and county in 1854. Originally encompassing the area from Chestnut Street to South Street, between the Delaware River and Seventh Street, the Fifth Ward was part of the oldest section of Philadelphia. Long home to immigrants and African Americans, the area’s southernmost border along South Street and its vicinity had been the scene of race riots during the 1830s and 1840s. By the early 1850s, the collapse of the Whig party also led to new groups arising to seize political power, pitting newer Irish immigrants against nativist groups, at a time when the city also sought to combat disorder by professionalizing the police force. By the late nineteenth and early twentieth centuries the area became increasingly crowded and diverse, housing predominantly Russian Jews and African Americans, with smaller numbers of Italians, Irish, and persons of Slavic ancestry. While more prosperous Philadelphians moved to newer and more fashionable areas of the city, like Rittenhouse Square, poor newcomers to the Fifth Ward lived in and amid crowded streets and alleys, apartments, taprooms, cheap rooming houses, warehouses, and small stores. In this increasingly marginalized district, murder and prostitution became chronic, and law enforcement nonexistent. Disease, such as tuberculosis, also plagued the area into the early twentieth century. By the late nineteenth century, Election Day violence, fraud, and other crimes including murder, often relating to immigrant and inter-ethnic conflicts between rival factions, became widespread. After decades of discrimination by nativist groups and the white Anglo-Saxon Protestant establishment, the Irish population grew to become a political force. As the Irish competed for the blue-collar and unskilled labor jobs and sought to overcome stereotypes about being unclean and lazy, they also began to displace many blacks from neighborhoods that had been predominantly African American. On Election Day in 1871, violent conflict among the Irish, African Americans, and the police spilled over in both the Fourth and Fifth Wards after blacks obtained the right to vote for the first time. 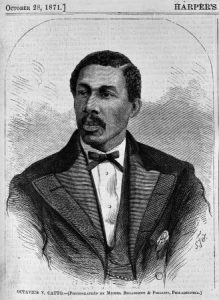 On that day, murder claimed the life of African American civil rights activist and educator Octavius Catto (1839-71). These wards had become Republican strongholds shadowed by the influence of Fourth Ward boss William McMullen. Rivalries in the Bloody Fifth persisted well into the early to mid-twentieth century as two factions of the local Republican Party, led by William H. Vare (1867-1934) and Jim McNichol (1864-1917), battled for votes and lucrative contracts for city services. At the pinnacle of the era of Republican machine politics controlled by ward bosses, the Fifth Ward’s most notorious conflict occurred during a heated primary race in 1917 for the office of Select Councilman and ended in the death of a police officer. 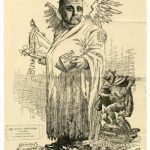 This incident centered on the election of the Vare-allied Isaac Deutsch (1874-1919) and James A. Carey, the McNichol candidate also aligned with Sen. Boies Penrose (1860-1921), the Republican leader in Philadelphia and in Pennsylvania. According to later testimony, Deutsch’s supporters brought in eighteen men from New York City’s Frog Hollow Musketeers gang who attacked and beat Carey. While defending Carey, police Officer George Eppley (1887-1917) was gunned down and died soon after in a hospital. Though not directly tied to local inter-ethnic violence, the hitmen for the Frog Hollow gang were Italian, a newer immigrant group seeking a foothold in American society similar to the earlier history of the Irish. The gunmen from the New York gang who shot Eppley were later convicted of second-degree murder. Deutsch and six officers were found responsible, guilty of conspiracy, and imprisoned. 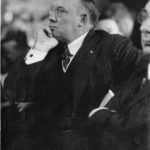 Philadelphia Mayor Thomas B. Smith (1869-1949) was also indicted for interfering with an election. Smith, president of a bail bonds company, was alleged to have said “clubs would be trumps” during the primary contest and accused of abusing his position to assist Deutsch by sending policemen to protect the Vare machine candidate. Smith was acquitted of conspiracy to murder and other charges in early 1919, but suspicion followed him until his term ended in 1920. The violence of 1917 triggered local protests and helped reform candidates temporarily halt the political machine. Although the Republican political machine began to decline by the mid-1930s, as many voters switched to the Democratic Party during the era of the New Deal, violence continued to flare up well into the 1940s because poverty and poor living conditions persisted. 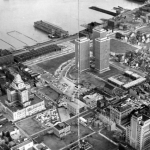 In the second half of the twentieth century, however, redevelopment of the area as Society Hill and gentrification changed the character and dynamics of the community and buried the Fifth Ward’s violent past. Frank Fuller is an Adjunct Professor of Political Science at Temple University and Chestnut Hill College. He has also taught at Villanova University and Rowan University. He holds a Ph.D. in Political Science from Clark Atlanta University, an M.S. in International Affairs from the Georgia Institute of Technology, and a B.A. in Politics from Oglethorpe University. Avery, Ron. City of Brotherly Mayhem. Philadelphia: Otis Books, 2003. Bennett Stern, L.C. Bosses and Blackjacks: A Tale of the “Bloody Fifth” in Philadelphia. New Jersey: Createspace Independent Publishing Platform, 2016. Biddle, Daniel R. and Dubin, Murray. “Winning the right to vote, at a heavy price.” Philadelphia Inquirer, September 14, 2010. Hudson, Samuel. Pennsylvania and Its Public Men. Philadephia: Hudson and Joseph, 1909. Ignatiev, Noel. How the Irish Became White. New York: Routledge, 2009. McCaffery, Peter. When Bosses Ruled Philadelphia . University Park, Pa.: The Pennsylvania State University Press, 1993. Phillips, Nancy. “Incident Stirs Memories of Violent Political Past.” Philadelphia Inquirer, August 28, 2003. Silcox, Harry. 1986. “William McMullen, Nineteenth Century Political Boss.” The Pennsylvania Magazine of History and Biography vol 110, no. 3: 389-412. Weigley, Russell F., ed. Philadelphia: A 300-Year History . New York: W.W. Norton & Co., 1982. Williams-Rude, Beatrice. Misadventures of a Would-Be Muse. Philadelphia, Pa.: Xlibris Co, 2011. “Government by Murder: The Unhappy Plight of Philadelphia, Special Correspondence.” The Outlook. October 24, 1917. “Men Higher-Up Sought in Fifth Ward Murder.” Evening Public Ledger, September 20, 1917. “To Arrest Mayor in 5th Ward Murder Case.” Evening Ledger, September 20, 1917. “’Men Higher Up’ Sought in Fifth Ward Murder.” Evening Ledger, September 20, 1917. “Policeman Killed in Political Feud.” New York Times, September 20, 1917. “Sullivan taken on Isle: Big Witness for Rotan.” Evening Ledger, October 8, 1917. Polling place and site of 1917 Bloody Fifth Ward murder of Officer George Eppley, 607 Delancey Street, Philadelphia. McCall Elementary School, 623 Spruce Street, Philadelphia. Site where Eppley collapsed after being shot. Burial site of George Eppley, Saint Denis Cemetery, 2401 Saint Denis Lane, Havertown, Pa.
Polling place and site of 1871 ethnic violence, Sixth and Lombard Streets, Philadelphia. Octavius V. Catto gravesite, Eden Cemetery, 1434 Springfield Road, Collingdale, Pa.